Wafer check valves use a swinging disc to allow or block flow. 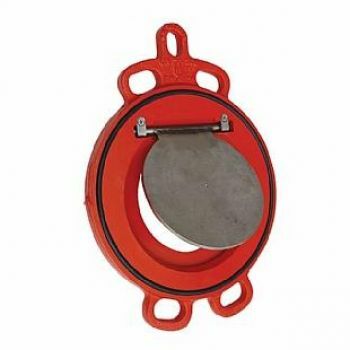 Their design allows them to be fitted in extremely tight spaces – where the flanged check valve can not be used. The wafer check valves have molded bodies around the area where the disc opens up. This is the most important difference between the above two types of valve. While at first glance this may just seem like a space issue, the presence of a valve body as opposed to the bare bones wafer check actually makes a big difference in the functionality of the valve. Because flanged check valves are flanged in place, there isn't much room for the disc to open in the pipe line. That means flow is often restricted within the check valve. 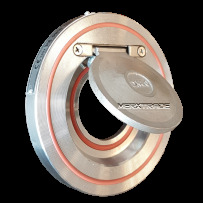 Wafer check valves on the contrary have a molded body that creates room for the disc to swing open fully, thus allowing full flow. As you can imagine, this is very important if your application requires full flow. For this reason, we usually offer wafer check valves for applications where flow is not an issue, and swing check valves when a full port valve is required. Application The swing check valves are self-acting and fast-closing valves which prevent a working medium from flowing back in a pipeline. They are used in order to prevent from backflow the pumps, fans etc. The check valve is not a shut-off valve. Direct installation between DIN flanges, Short construction length suitable for small spac..